I have been playing around with watercolors lately. And, I am loving this “Happy Birds” stamp set, since all of the images stamp with a lot of white space that is perfect for coloring in! This 5″ x 6″ card was made with a Crystal Blue cardstock base, and then overlayed with Pixie cardstock and watercolor paper. I started by coloring the background with blue, pink, and green watercolor pencils, and then blended those colors with a blending pen for a softer look. I added a little yellow sun to perk it up a bit. 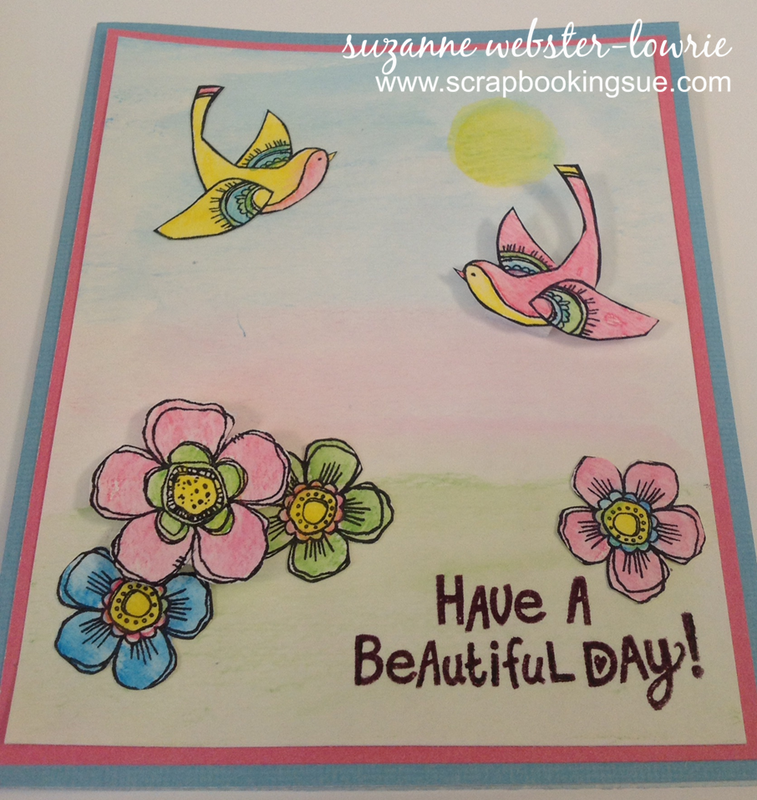 The “Have a Beautiful Day” sentiment was stamped directly onto the watercolor paper in Black ink. Since the watercolor paper has a lot of texture, I found that my image didn’t exactly stamp as nicely as I expected. So, I took a black journaling pen and colored in some of the missing spots in the words. The birds and flowers were also stamped in black ink, then colored in with watercolor pencils and blended with the blending pen. All of the the images (except the sentiment) were stamped onto separate pieces of watercolor paper and then fussy cut with my micro-tip scissors. Most of the images were glued straight onto the paper. However, I used foam tape to pop up a couple of images, including the large pink flower and the pink bird. 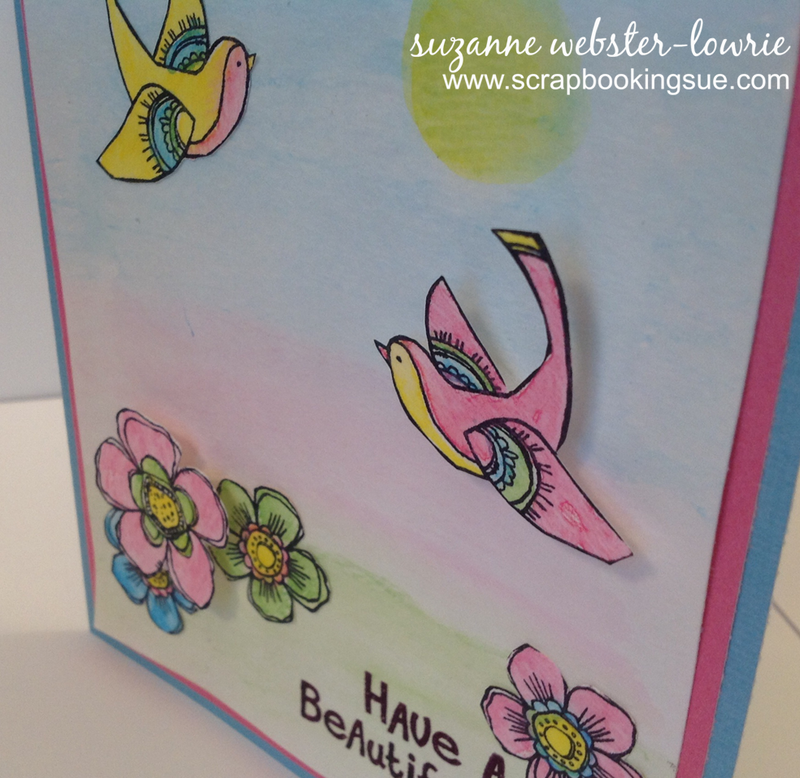 Here is another card I made with the “Happy Birds” set and watercolor paper. This card is 5″ x 7″ and is made with a White Daisy cardstock base. 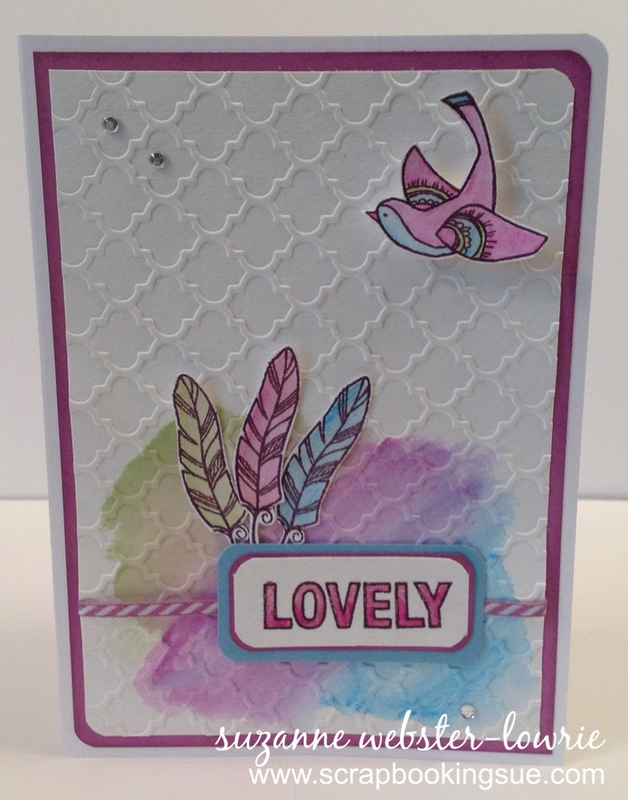 Other cardstock used include Thistle and Crystal Blue. I colored green, purple, and blue in the lower left of the paper with watercolor pencils, and blended with the blending pen. 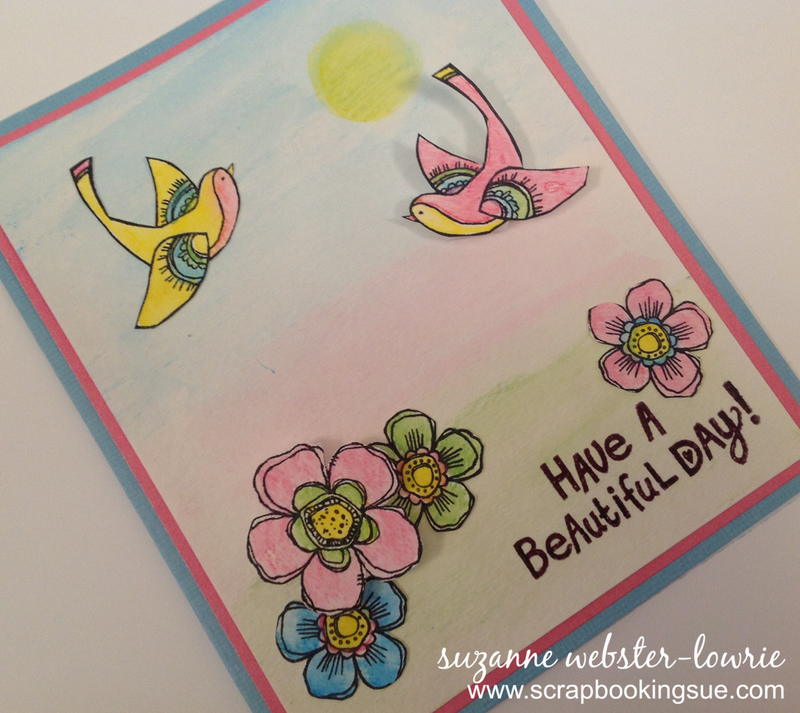 Once dry, I ran the sheet of paper through my Cuttlebug machine with a Quatrefoil embossing folder. All of the images were stamped separately with Black ink, colored in with the watercolor pencils, blended, and then fussy cut. 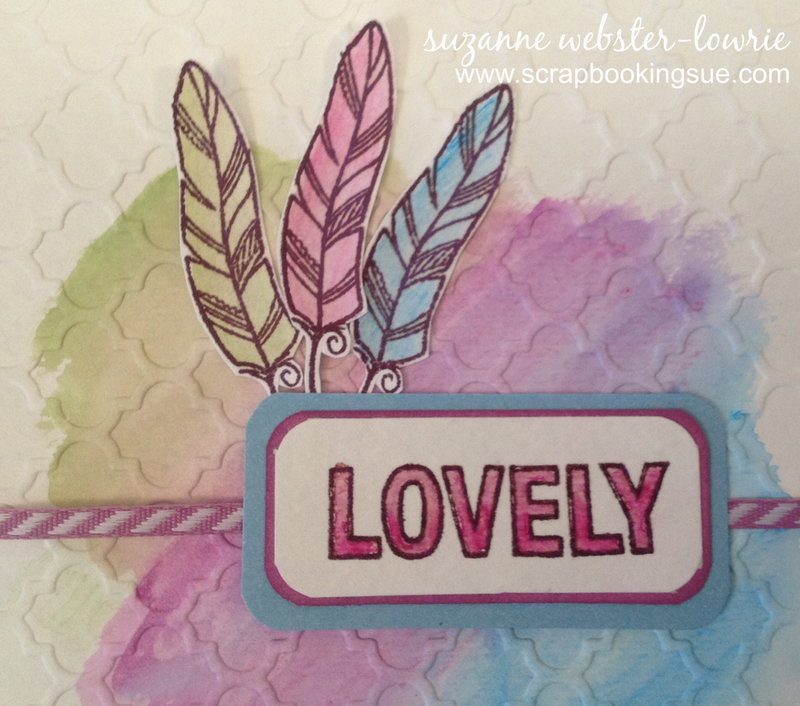 A piece of Thistle Diagonal Striped Ribbon was added horizontally around the paper, and then a layered “Lovely” sentiment was glued on top. The 3 feathers were glued behind the sentiment, and the bird was popped off the page with foam tape. Finally, 3 clear sparkles were added for some bling and shine!